Jonah is a member of his high school’s US FIRST robotics team. 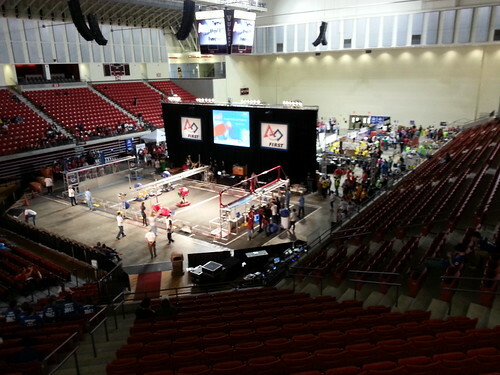 We joined him in Uniontown, PA for his team’s chance to compete against other schools. I helped Jonah and his teammates a bit at the beginning of their season by providing some guidance on Linux. It wasn’t much, but it somehow earned me the title of “mentor.” Maybe I can live up to that title next year. On the few occasions I participated, I was generally impressed with their robot, and the speed with which they assembled it. Walking into the competition area today, though, gave me a whole new perspective. The other schools’ robots are all extremely well done. Dauntingly so. Watching some of the practice rounds was nothing short of awe-inspiring. While I was smoking cigarettes and listening to death metal at 16, these kids have figured out hydraulics, electronics, and computer vision systems, not to mention basic mechanical skills that I still lack! 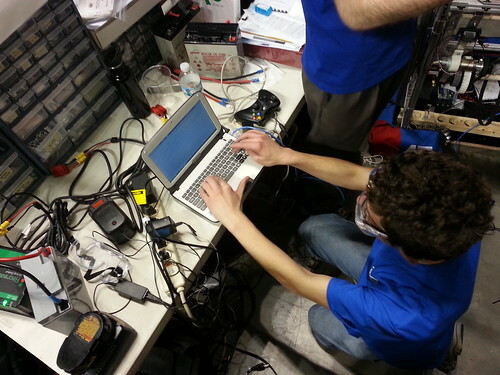 Jonah’s team’s robot had some problems today, and was utterly unable to move during its practice round. I helped investigate the situation afterwards, and it appeared to me to be a networking issue between the control station and the robot. Due to time constraints (and some rather inflexible rules), they were unable to verify that they resolved this problem, so they’ll be going into tomorrow’s competition with more than a little trepidation. Despite this, and despite the odds being against them in light of some of the competition, Jonah and his team are in pretty good spirits. They’re pretty realistic about their chances, and are looking to enjoy the experience, as well as to pick up a few ideas for next year’s competition.